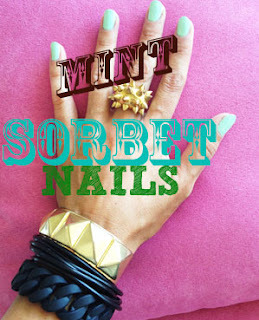 I'm am loving this Mint Chocolate Chip Ice Cream shade of nail polish! (sans the chocolate chips ofcourse!) Oh, my neon polishes are still right up there at the top...but there's something so whimsically, girly, yet chic and modern about this color- me loves! Me loves it! Sally Hansen Hard As Nails Extreme Wear in MINT SORBET. This polish is kind of amazing- 2 coats and it looks beautiful- it was glossy, smoothed out any ridges my nails had (yeah they are natural and kinda well un-smooth like natural nails are! ha ha), and last longer than my average nail polish- I'm HARDDDDD on nails...and this was tough like John Wayne in a cowboy movie! It's like having an ice creamy treat on you nails with zero calories, well and zero flavor....but as far as your eyes are concerned- it's the color of ice cream baby! Did you see my new video yet!? CLICK THIS if you didn't! PS. If you wanna see Blakey's Birthday yesterday- click here, it has bowling shoes! I have the same exact color and I love it too! I'm a manager of an antique store so it fits right in lol!! Great colour. Spring has just started in Australia and that is the perfect colour for the season!